This mornings unemployment rate was announced as having dropped 2/10 of a percent and now stands at 9.7% (compared to 8.1% in Canada). However, according to ShadowStats.com the stats are massaged to show a way too flattering result. 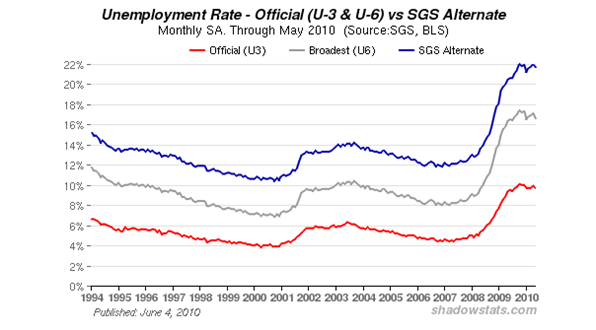 If, again according to them, the old way of calculating this statistic was used, that is if the longer term unemployed were not simple ignored, the rate would be as high as 22%. The U-6 rate is actually reported and stands at 16.6%. Over and above that the US has the doubtful distinction of having the largest proportion of any civilized country of their citizens behind bars ( hopefully they do not also receive Old Age Security on top of their room and board as they do in Canada). Arguable this also flatters the situation even more. Anyway, with 1/5+ of your population not working it is not clear how this recovery can be self sustaining.